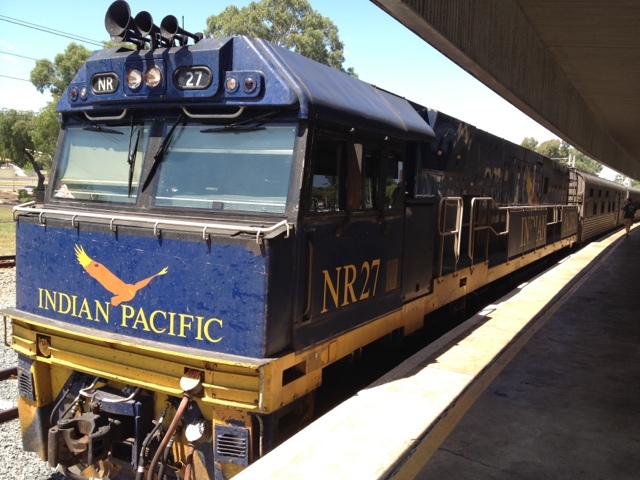 The Indian-Pacific train journey is fun enough to do and travelling on it from Perth to Sydney certainly gives you enough of an appreciation of just how vast Australia really is. Taking three full days and nights you get to travel across the Outback through eighty-six towns and settlements stopping once or twice a day on the way for the train to refuel and take on water. This can take up to three hours at some places. At these stops you often get the opportunity to disembark the train, look around, take some snaps or do a local 'tour'. Generally these tours are disappointing though and/or over-priced so we found it better to do it under our own steam. To be honest, if you've seen the open-caste mine, the wooden-housed main street and ropey red light district in one dusty town you've seen them all. We did stop in one place though that was quite interesting. It's a place called Cook. It's in the middle of nowhere in the desolate Nullarbour Plain. It used to be a thriving town with a school, houses, a bank, a swimming pool and sports facilities. Now it's virtually a ghost town. Population of just 5. All members of the same family. Darwin only knows how they'll not end up shooting each other. Or worse. As for the train itself each carriage is silvery grey and collegated horizontally. Not unlike a long linked up chain of baked bean tins with their coverings removed. The cabins are compact - just big enough for two. The en suite is barely worthy of such a name. It's a small cupboard of a room with a flip-down sink and a flip-down toilet that both need very careful handling. Otherwise you end up with either soapy or piss-stained shoes respectively. The en suite also doubles up as a shower room. Sorry, shower *cupboard*. Are there no end to its talents? Still, it's nice to have somewhere to retire to. At night the sofa converts into a bed and another pulls down from the wall with a ladder creating a set of bunk-beds. Moderately comfortable they may be but with the sudden rocking and jolting of the train sleep is hard to come by. The staff onboard are all very chipper, friendly and keen to please. The food, which is included in Gold class anyway, is excellent and plentiful. All you pay for is your drinks which you put on a tab and pay at the end of the trip. The meals are provided in the dining car at tables of four. So we get to share breakfast, lunch and dinner with a different couple each time which can put quite a bit of strain on the small talk. But when other topics run dry we can always fall back on the European economy, the Queen, the London Olympics and house prices to see us through. All in all it's been a great trip and well worth doing if you've got the time and the money - it ain't cheap: just shy of AUS$3000. Ouch.